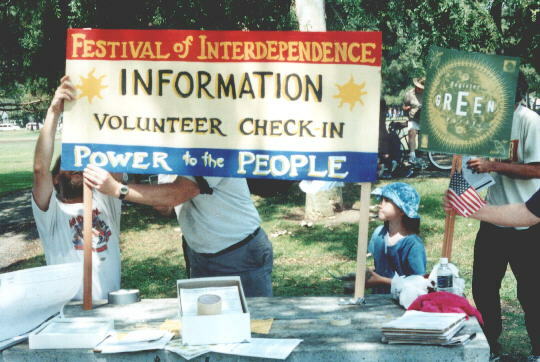 (July 4, 2001) -- Escorted by LBPD and drawing L.A. news media, a July 4th "Festival of Interdependence" and "Power to the People Parade" by a group calling itself "People for Community Empowerment" (PCE) rallied at El Dorado Park, then marched down Studebaker Rd. to the AES power plant near Loynes Dr.
A self-declared "Notice of Seizure by Eminent Domain" was posted on the plant's fence, vowing to conduct a "public trial" on August 3 on the "charges" in the "Notice." For reference, LBReport.com has posted the group's "Notice" and other parts of a flier distributed at the event's Information table. Page 1 indicates scheduled speakers, supported state legislation and a partial list of endorsing organization. Pages 2-4 (from the reverse side of the flier) show the "Notice of Seizure by Eminent Domain" (p.2); "What we want" and "Points of unity for our actions" (p.3) and a list of future events (p.4). To view these pages in pdf form, click here. LBReport.com counted roughly 50 people at El Dorado Park at about 11:15 a.m. Two witnesses (including Beachcomber publisher Jay Beeler) said the crowd grew to 200 (participants plus onlookers) at the height of the park proceedings. LBReport.com counted roughly 120-150 participants marching from El Dorado Park to the AES plant between 2:15 p.m. and 3:30 p.m. The event drew sizable L.A. media coverage. 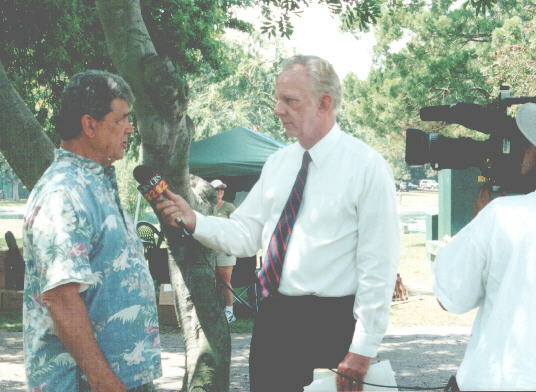 At left, Earthcorps President Don May is interviewed by KCBS-TV reporter Mark Coogan. Other L.A. media spotted at the event included KABC-TV (Channel 7), KCAL-TV (Channel 9) and KFWB Radio All News 980 (AM). Part of the media interest stemmed from PCE's recent federal court victory against LB City Hall. After initially being denied a permit to march, PCE (represented by the ACLU) won a temporary restraining order (TRO) from federal judge Robert Takasugi who questioned the constitutionality of LB's policy for public gatherings. The federal court TRO prevented City Hall from requiring demonstrators to give advance notice of their plans and to pay insurance the cost of police protection. City Hall then granted the group a permit. A full hearing on the constitutionality of the City Council-enacted ordinance is scheduled for July 16. Several weeks ago, members of LB's Cambodian community publicly warned the City Council about the manner in which LB's ordinance was applied to them when they tried to hold their Cambodian New Year celebration. The Council verbally sympathized, suggested more reasonable application of the law but didn't substantively change the ordinance. Possibly adding to LBPD concerns, on May 1 a group of anarchists converged on downtown LB for a "May Day" event. This triggered a forceful LBPD response that some criticized but others say may have prevented possible violence. The PCE July 4th event ran smoothly. LBPD were visible in large numbers, virtually escorting demonstrators and coordinating closure of freeway exits and intersections to allow a clear route for marchers. 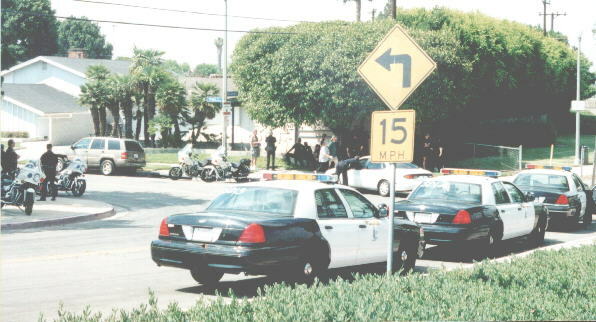 LBReport.com saw LBPD motorcycle and patrol cars heavily deployed; we estimate roughly 50 officers or more were in the area, some along Studebaker Rd., others on side streets between El Dorado Park and the AES plant. These officers (right), available if needed but not visible from Studebaker Rd., were discreetly tucked away on a side street west of the plant. An LBPD helicopter circled overhead near the AES plant. An LBFD fire truck was out of main public view, along with an ambulance. 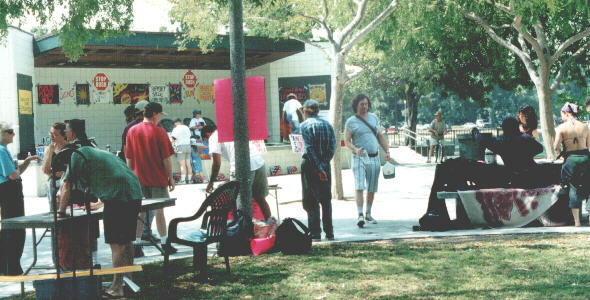 El Dorado Park, 11:15 a.m., activists finish setting up their informational table distributing fliers. People gathered near the El Dorado Park stage, which was filled with signs. Examples: "Stop Bush," "Public Power Now," and American flags overlayed with black letters spelling "SOLD." Several participants sandpapered the Bush administration. These dub the President and V.P. "Fossil Fools." 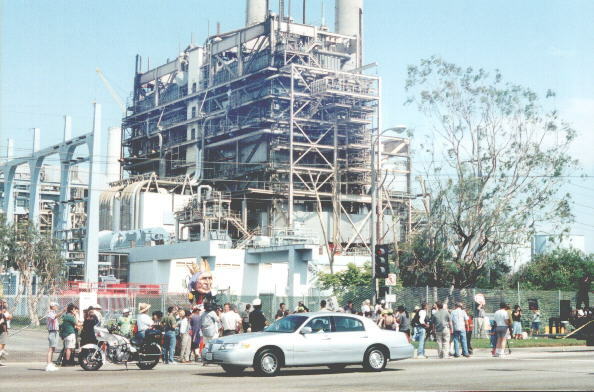 Marchers (accompanied by traveling crowned head of "King George" Bush, visible on sidewalk above passing car's front bumper) arrived at the AES plant, placed a self-declared "Notice of Seizure by Eminent Domain" on the plant's fence, then dispersed.